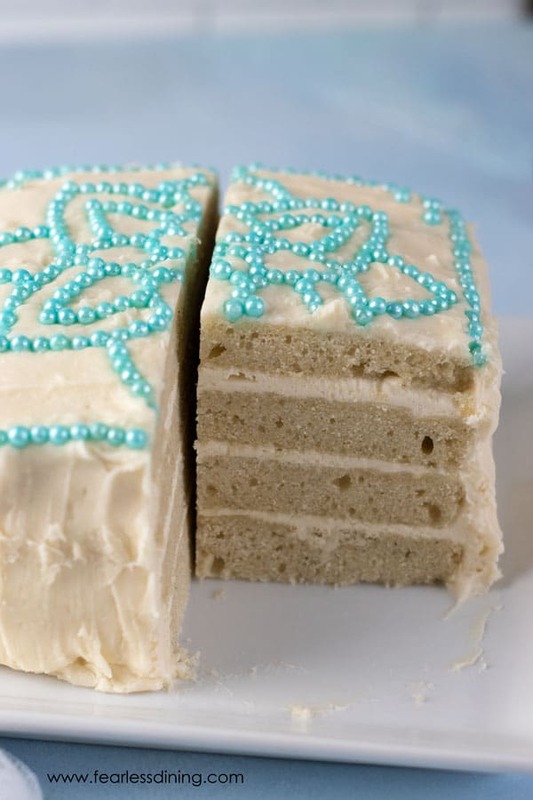 This gluten free vanilla cake is as stunning as it is scrumptious! Whether you are looking for a beautiful gluten free cake for your next birthday party, celebration, or wedding cake base, this will be just what you need. No matter what, this gluten free cake is going to impress! This light and moist white layered cake is covered in sweet cream cheese frosting and is baked to perfection. Every bite has the most incredible ratio of cake to frosting. My daughter is very artistic and loves to freehand these gorgeous mandala designs. 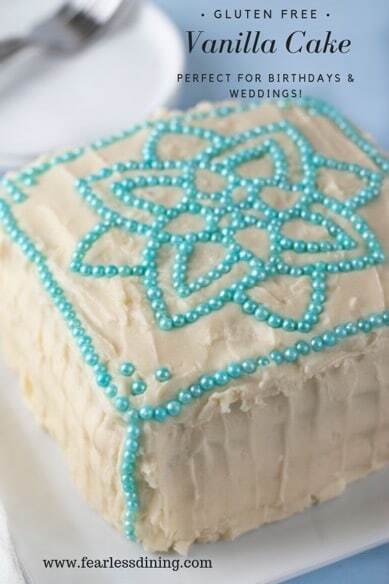 This cake was inspired by her desire to decorate it with a mandala. I have to brag a little bit because she did an impeccable job! You can see more of her fabulous art on her Instagram account. She has donated a couple of pieces for charity fundraisers. If you are like me and have kids that have allergies, it can be nervewracking to allow them to be out of your sight. As they get older, they are more likely to go on school trips without you. I made this guide to help ease some of that stress. Have a look at Ways To Keep Your Allergic Safe On A Overnight School Trip. 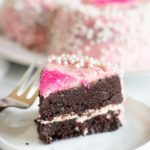 What Gluten Free Flour Is Best For Cakes? While there are many different gluten free flour options for sale, I have a few that I regularly use with great success like Bob’s Red Mill 1 to 1 Gluten Free Blend, Pamela’s Gluten Free Blend, Authentic Foods Multiblend is very cool because they mill their gluten free extra fine so there isn’t any grit. This will allow a much smoother texture. I also like King Arthur’s Gluten Free Blend. Just make sure the gluten free flour blend has Xanthan gum added. If not, you will want to add 1 teaspoon. As I mentioned before, this cake is perfect for a party, a wedding (though you will need to triple the recipe or more depending on the number of guests! ), or any occasion. I used these cute little-layered baking pans so that all of my layers were the same size! Don’t you want to grab the fork and have a bite? A lot of people ask if it is hard to assemble a layer cake. I can promise it looks much harder than it is! Make cupcakes with this recipe. Perfect for holidays and other gatherings. You can make a sheet cake for a birthday party or any other event. Whip this recipe into cake pops for a fun spin. Make it as a layered cake to add extra elegance to the cake. 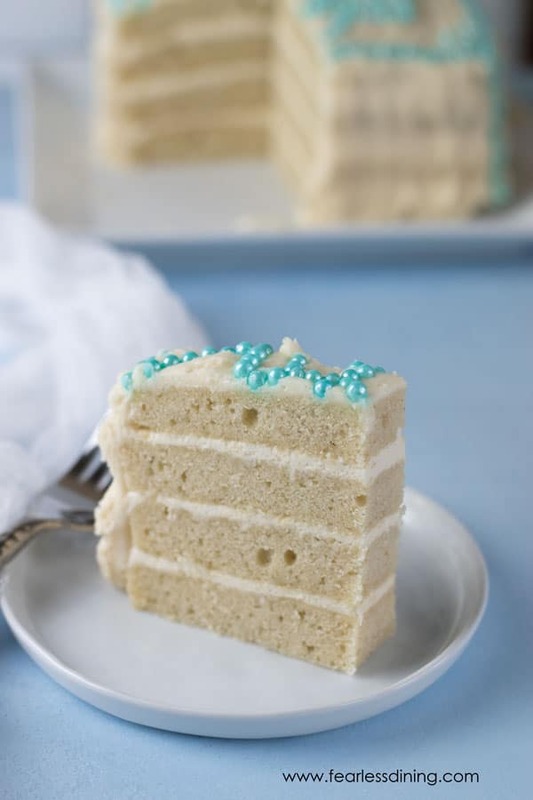 Are you ready to see how easy this gluten free vanilla cake recipe is to make? (And don’t worry, I will include the cream cheese frosting recipe too! In a smaller bowl, add the wet ingredients and whisk to blend. Pour the wet ingredients into the dry ingredients and mix well. Your gluten free cake batter will be creamy like in this photo. 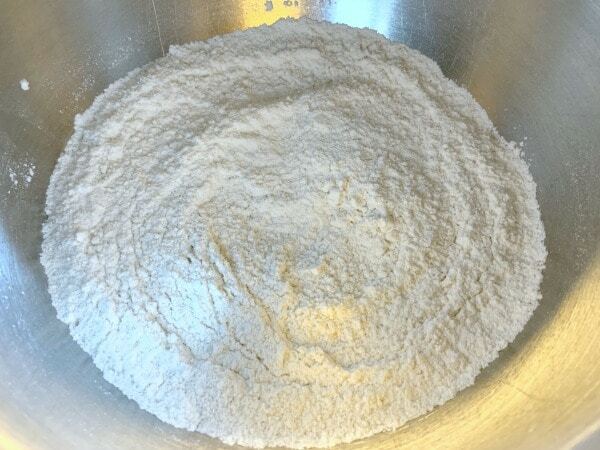 Sometimes different gluten free flour blends behave differently depending on how much starch is in the mix. You may need to add a little extra liquid if your batter is too thick. 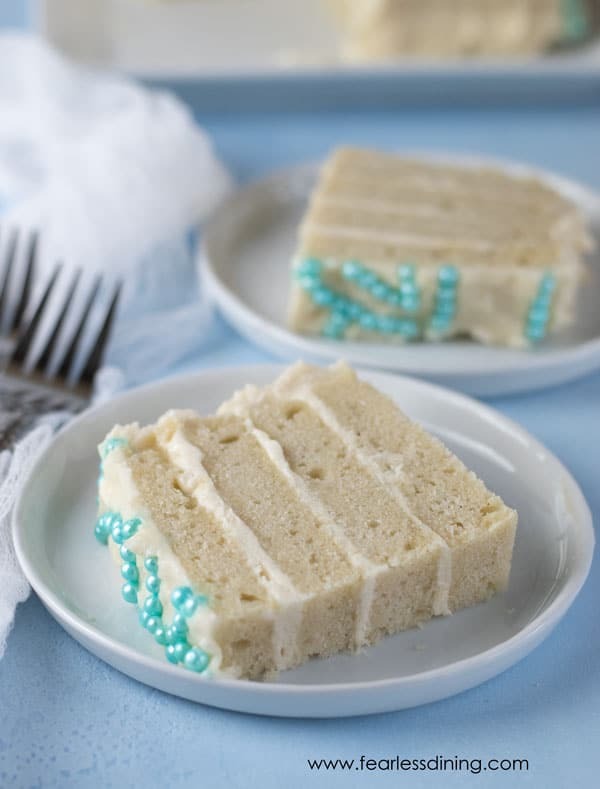 Add the cake batter to your layer cake pans (or cupcakes or sheet cake!) and bake. For these little layer cake pans, I baked the cakes for 20 minutes. If you are using larger cake pans, you will need to bake the cake longer. How Do You Know When The Cake Is Done Baking? There are several ways to tell if a cake is done baking. You can try all the methods or just use the ones that work for you. The toothpick test is the most common. Just stick a toothpick in the center of the cake and pull it back out. If it comes out clean and free of liquid, then your cake is done. Another way to check is if the sides are pulling away from the pan then it is a good indicator the cake is done. You can also use your finger to check the texture of the cake. If you press down on the cake and it doesn’t bounce right back up, then it probably needs to cool a little longer. To make the frosting, add softened cream cheese, butter, powdered sugar, and a bit of water to a bowl and mix well until thick and creamy. How Do You Assemble A Layer Cake? To assemble a layer cake, you must first add the base layer to your plate or cake stand. Next, add a layer of frosting on top of the base layer and spread it around. Next, you add another layer of cake, then another layer of frosting. You keep adding layers until you have used all of them. 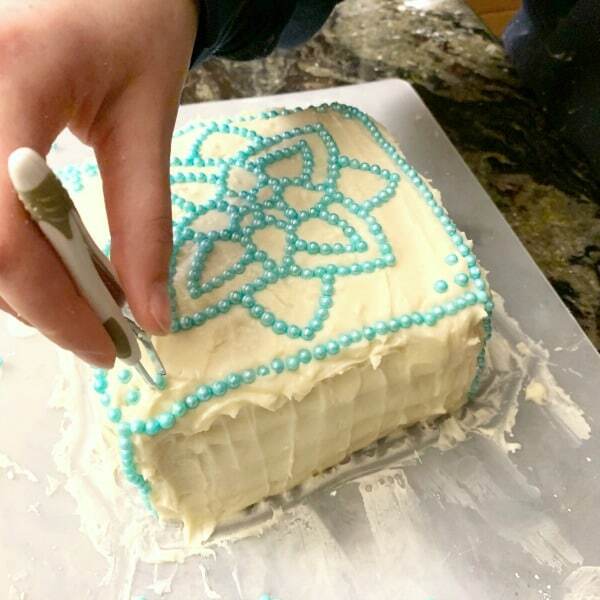 After all your layers are together, then you can continue to frost and decorate the cake. How Do You Lift A Layer Cake Onto A Cake Stand? The easiest way to lift a layer cake onto a cake stand is by using a giant spatula. Simply place the spatula under the cake and raise it. You will want to make sure to hold the cake with your other hand to ensure you don’t lose balance. Decorate the cake any way you like! 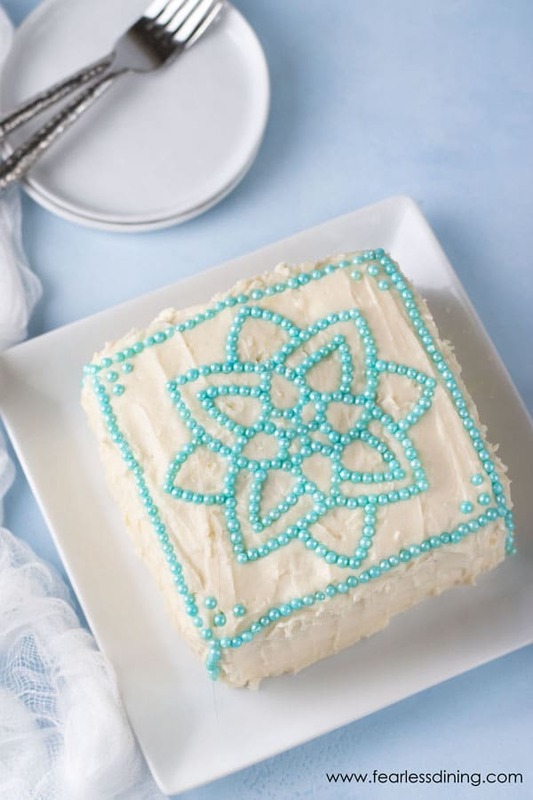 Cake Stand to make decorating so much easier! Sprinkles that are gluten free. 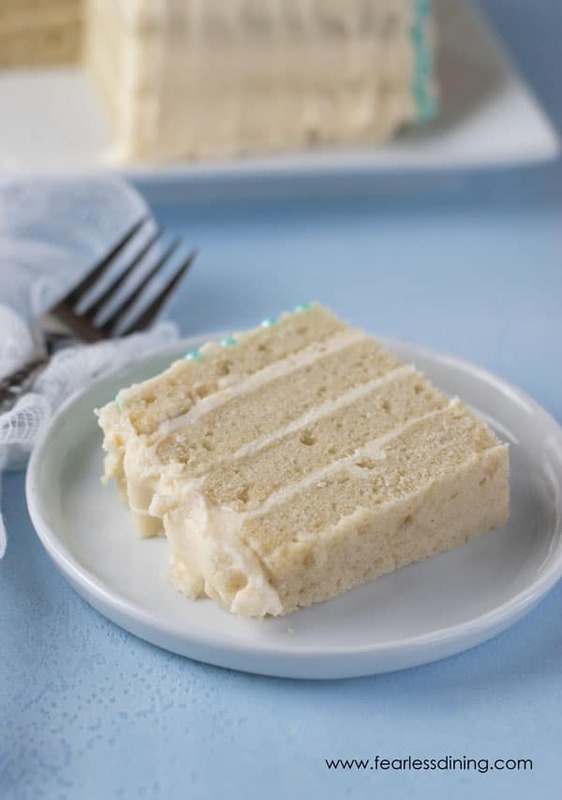 A deliciously light gluten free vanilla cake that is perfect for birthdays, weddings, or any party. 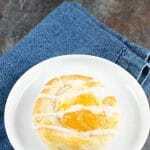 This recipe can be made into cupcakes, sheet cake, or a layer cake. 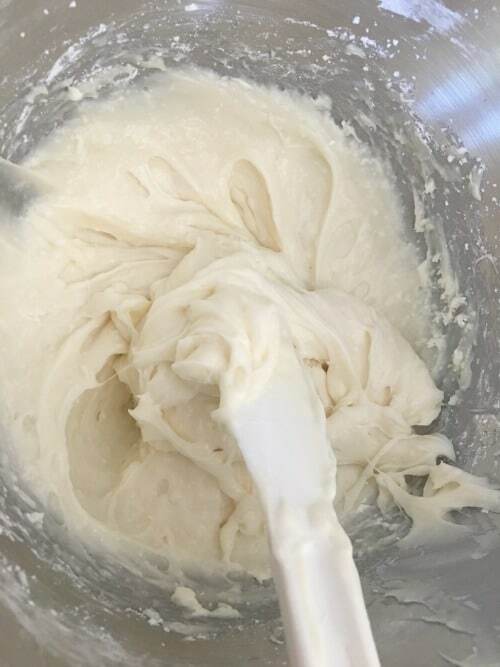 Homemade cream cheese frosting. 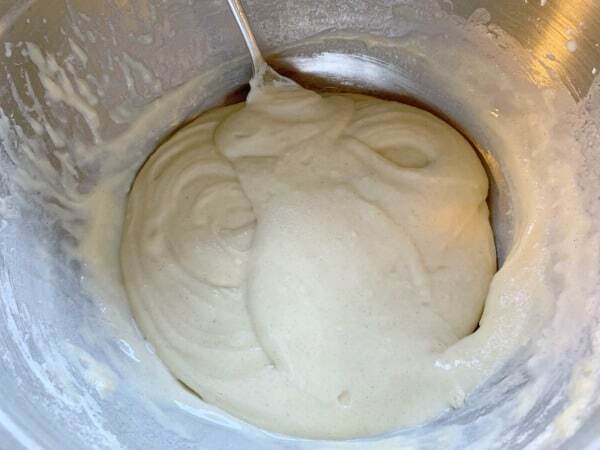 In a large bowl, add the dry cake ingredients and use a whisk to blend. 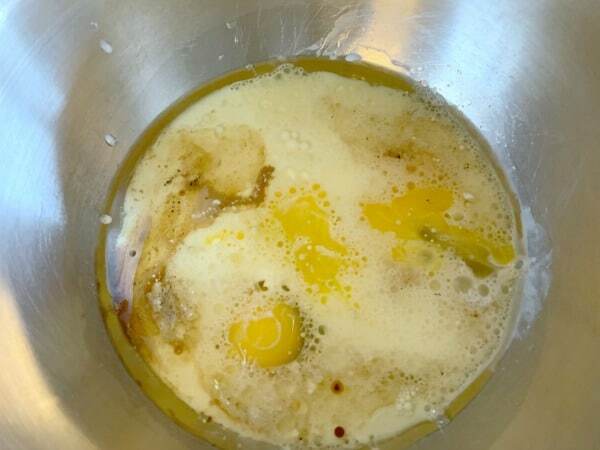 In a smaller bowl, add the wet ingredients and whisk to mix. Pour the wet ingredients into the dry ingredients and mix well. Note photo above of the batter consistency. 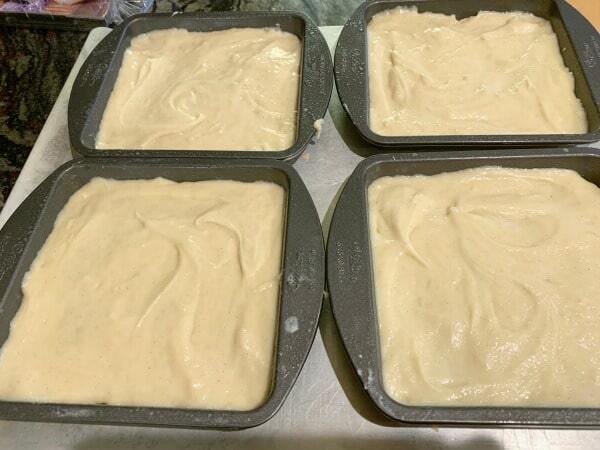 Spoon batter into greased cake pans, or cupcake pan. 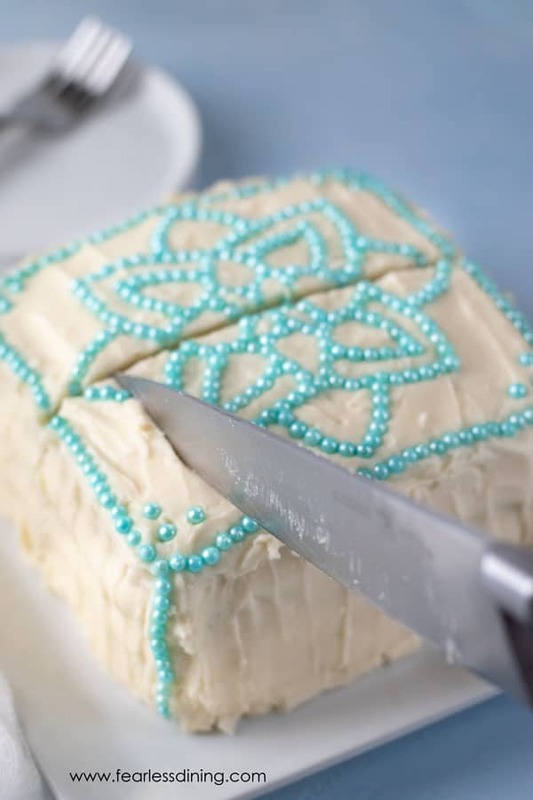 Use a knife to level any bumps to make your cake layers flat. Place the bottom layer of cake on a cake stand. Add frosting to the top of the layer. Place the next cake layer on top of the frosting, and frost that layer. Repeat until all layers are frosted. Use a cake spatula to frost the top and sides of the cake. Decorate how you like. Love how light it looks, even being gluten-free. 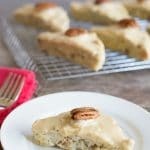 Just curious which flour did you use in this recipe (since you recommended a few). 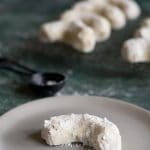 I make this recipe fairly often and have used all of the flours I list…this specific time I used Bob’s Red Mill 1 to 1 GF blend. 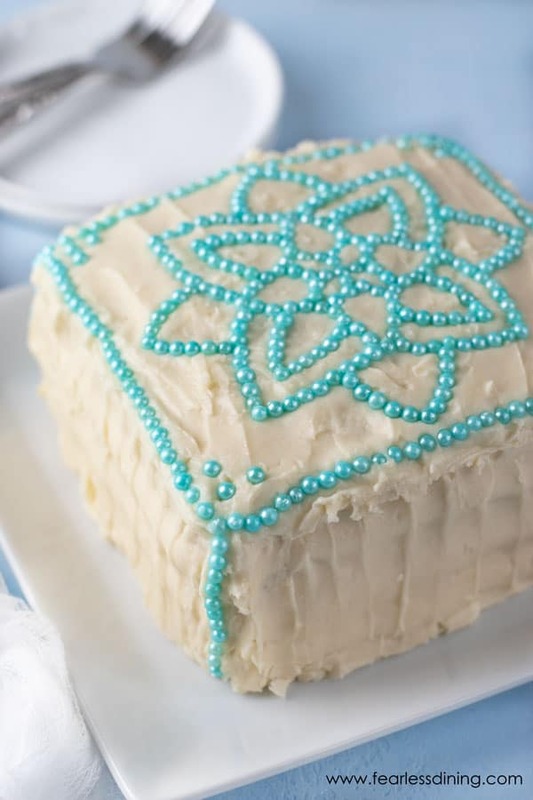 I’m always on the lookout for a good GF vanilla cake recipe, can’t wait to try this! Going to send this recipe to my mom, she will LOVE it! Looks like my new favorite cake!! This is screaming my name!! What a beautiful cake! I wish I had a slice right now! Looks fabulous! 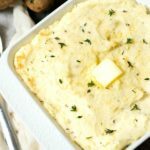 My kids love it, this is for sure a huge hit on the table and I’m so excited to make this! Awww, thank you Melanie. I hope your kids like it as much as mine did. 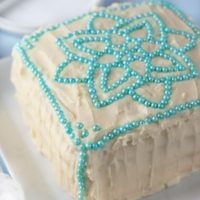 I’ve been searching for the perfect gf vanilla cake! This is fabulous! Thank you for sharing! It’s so wonderful to be able to make a beautiful gluten-free cake like this one. Very nice! I’ve been looking for the perfect gluten free cake, and I’ve finally found it! This cake is the best! Awesome, I hope you like it as much as we did! Awww, I hope she has a great birthday! Wow!! Your daughter did an absolutely amazing job on that design! I thought it was almost too pretty to each until I saw a slice. I’ve changed my mind, I definitely couldn’t resist eating this. LOL I was terrified to cut into it! This was incredible thank you! !